Five-story-tall pagodas are few and far between, so much so that in Tokyo, Kyoto and Hiroshima Prefecture the sites are regular stops on tours. 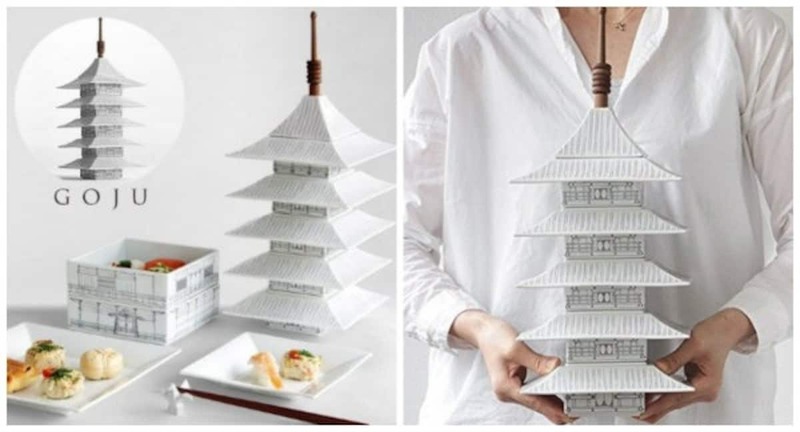 Now you can bring a little of that prestige to your dinner table, with this five-story pagoda-shaped tableware set from Japanese manufacturer Koto. 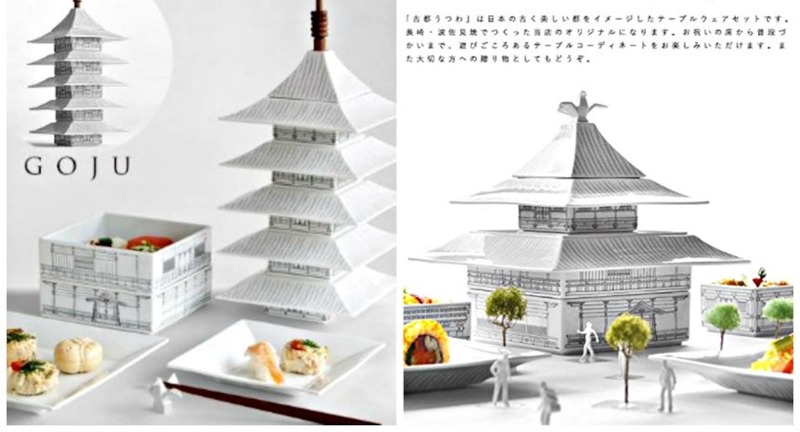 Called Goju (from goju no to, the Japanese term for “five-story pagoda”), the set is made from Hasami-yaki porcelain. When disassembled, the overturned eaves function as trays, the walls of each floor as box-like bowls, and the uppermost roof as a tapered container. Even the ringed spire at the top of the structure has a purpose, as the walnut circles are also chopstick rests. The set comes packaged in a paulownia wood box, with a bilingual Japanese/English explanatory leaflet printed on washi paper. Flip the leaflet over, and you’re presented with an aerial view of a Japanese garden on which to place the pagoda. Ironically, despite the undeniable cachet of the five-story variety in Japan, one of the country’s most famous pagodas has a smaller floor-count. But what Kinkakuji (also known as the Golden Pavillion) lacks in height, it makes up for in historical significance and stately aesthetics, and so it too serves as the basis for one of Koto’s tableware packages. The Kinkaku set is made from the same porcelain as Goju, but is slightly more varied in the size of its component pieces. There’s also only a single chopstick rest, but on the plus side, it’s shaped like the phoenix. The ¥35,640 (US$349) Goju can be ordered here through Amazon Japan, while the ¥32,400 (US$315.92) Kinkaku can be purchased here.